Although a baby cannot speak it is possible to measure their vision by watching their eye movements in response to patterns of light. From six months old it is possible to test their vision, stereo acuity or depth perception, convergence ability, ease of eye movement, presence of squint, of prescription, pupil responses to light and the health of the eye. From 18 months picture recognition cards are used to measure vision and a more refined examination is possible. From two and a half years shape recognition and matching gives a vision assessment that more closely resembles adult tests, and by three and a half years many children can copy letters from the adult charts. As speech and understanding increase the tests become more refined and further information is obtained about the competence of their visual performance. Regular eye examinations are essential as many eye problems are not present at birth but develop latter with growth and increasing workload on the eyes. Never be afraid to mention anything that is worrying you about your child’s eyes or to ask your optician to explain what they are testing for. 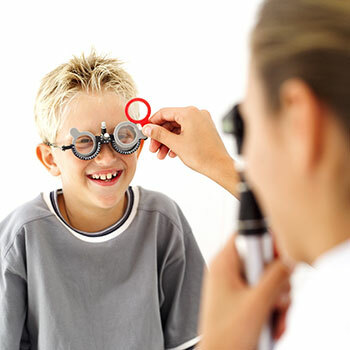 The eye examination is free under the National Health Service for every child aged 16 and under, or under 19 and still in full time education. Usually it will show that your child’s eyes are healthy and normal and your optician will send you regular yearly reminders for future eye examinations. Should your child require glasses, they would be entitled to a National Health Service voucher towards the cost. NHS vouchers also help towards the cost of repair or replacement due to breakage or scratched lenses. National Health Service offers eye exams for every child aged 16 and under, or under 19 and still in full time education.